The multidrug transporter EmrE functions as an asymmetric antiparallel dimer (molecule with two subunits). Drug (blue) transport from the inside to the outside of the cell membrane is accomplished by exchange between inward (left) and outward (right) facing conformations in exchange with two protons (green), directly visualized by nuclear magnetic resonance spectroscopy. Bacterial resistance to antibiotics is growing exponentially, contributing to an estimated 99,000 deaths from hospital-associated infections in the U.S. annually, according to the Centers for Disease Control and Prevention. One reason that this is happening is that drug resistant proteins are transporting “good” antibiotics, or inhibitors, out of the cells, leaving them to mutate. In a paper recently published in the journal Nature, Professor of Biochemistry Dorothee Kern and collaborators including former postdoctoral student Katherine A. Henzler-Wildman, looked at how one of these drug transporters, EmrE, works. The hope is that someday a drug will be developed to impede this motion of transport. The challenge with making drugs, says Kern, is that you need to kill specific targets but nothing else. Kern and her team studied the protein using nuclear magnetic resonance (NMR) spectroscopy, adding a drug mimetic in order to learn how the structure EmrE was designed and how it functioned as it was transporting — moving the drug from inside of the cell to the outside. Currently there are around 12 to 13 similarly known proteins within the EmrE family. Increasing the knowledge of how this protein works will hopefully help to target all of them. Once you understand that, you could design inhibitors that do not allow the protein to transport the “good” drugs out. Kern says EmrE actually bounces back and forth between two alternate conformations, hand-shaped structures that take one molecule, pump it out, return to grab the next one, then pumps that one out (Fig. 1). 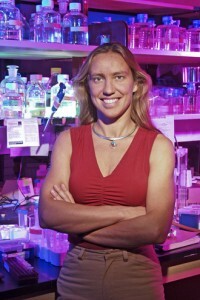 Kern says that she is extremely proud of her former postdoctoral student, who began working on the project at Brandeis in 2006 and has continued pushing and leading this project at Washington University in St. Louis, where she is now an assistant professor of biochemistry and molecular biophysics. Why are there so many resistant strains of bacteria? Antibiotics try to kill bacteria. To avoid being killed bacteria mutate, meaning that they change the structure of the amino acids within their cell. This way the protein is no longer able to be taken over by the antibiotic. As more antibiotics are being used, more new strains of bacteria are created that are resistant to current antibiotics, which is why bacteria and viruses are harder to target. Kern cautions against purchasing anti-bacterial products such as cutting boards, soaps and toothpaste as they are contributing to this rash of mutations. Kern says this is another reason why it is so crucial to complete a prescribed course of antibiotics when you’re sick even if you’re asymptomatic —if 95 percent of the bacteria are gone, there is still five percent that can develop resistance in a matter of days.